Docker Swarm is a clustering and scheduling tool for Docker containers. It turns a pool of Docker hosts into a single, virtual Docker host. Basically, you create a cluster of one or more Docker Engines called a swarm. There are two types of nodes: Managers and Workers. The managers nodes handle cluster management tasks- they orchestrate and schedule containers. Worker nodes are also instances of Docker Engine whose sole purpose is to execute containers. You can create your cluster of swarm easily through Spotinst Elastigroup. You will have to specify the Manager node (masterHost and the masterPort) and the nodes running on the Elastigroup will serve as workers. 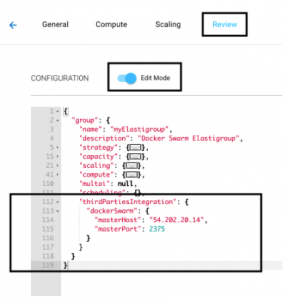 Our Docker Swarm integration is using the standard Docker api calls to trigger operations for instances. These operations include the Drain and Delete operations. When we detect that an instance is going to be terminated, we trigger the Drain operation and at last the Delete operation. Currently we support only HTTP method, without tls verification. When creating a new group, or when updating a group, you need to specify the Manager node by providing: masterHost (specifies the domain/ip of the docker master host), masterPort (specifies the port).